Those of us who grew up in what society calls the “Baby Boom” generation were entertained in our childhood by the best western movies and tv shows ever made. So, the old cowboy guns and gear have a near and dear place in our hearts not only because of the great old guns but memories of a much simpler time. Duty, honor and clear right and wrong themes were central to these old shows as were the guns the heroes wore. Most of us who grew up in this time have a special fondness for the 1873 Colt Peacemaker and Winchester lever action rifles. 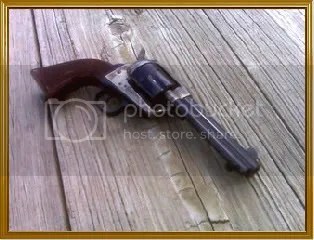 With these things in mind in recent years our generation has embraced the “Cowboy Sports” using replicas of these old guns. At one time original Colts were not terribly expensive and were widely used on the ranch and in early competition. These days they are collector guns and not many Colts are shot very often. Thank heavens we have great companies like Uberti who make a complete line of these old guns at pretty reasonable prices that will hold up to a lifetime of shooting. Uberti rifles and pistols are exact replicas of the originals and the quality is exceptional. Until a few years ago there were very few choices to be had in single actions and quality was mediocre at best. Now we have a good number of companies making single actions, shotguns and of course lever actions. My favorite brand is Uberti. 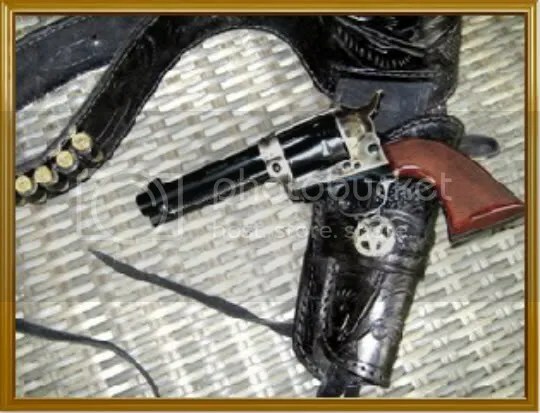 Made in Italy as are many western guns from the 1900’s this company is a real innovator in the field of Cowboy action shooting. Uberti El Patron with a Buscadero rig my wife purchased for me in San Antonio. I added the conchos later. As mentioned Uberti makes many models of handguns with various finishes and features mostly cosmetic in nature. With the release of the “El Patron” last fall that has changed. Most competition shooters spend a good deal of money getting a new single action ready for the range. 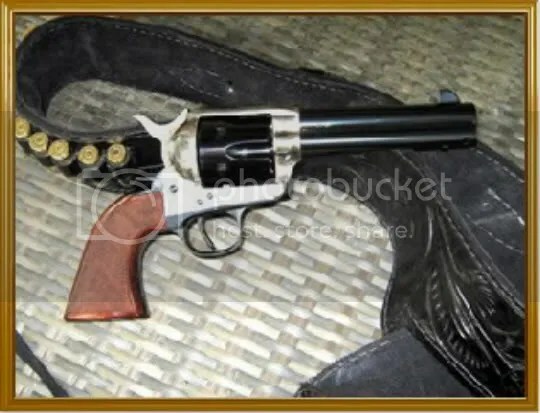 They have the action honed and many other enhancements by the best gunsmiths specializing in cowboy guns. 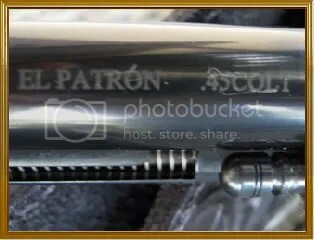 What makes the “El Patron” or in English “The Boss” unique is all the enhancements have been done by the custom shop at Ubert in Italy. When Uberti decided to make a full competition single action for SASS matches they sent the best parts to the custom shop where the cylinder and frame were stamped so they would not be mixed up with other parts. One artisan hand fits each revolver until completed. In the picture above you can see that each cylinder is marked 1 through 6. Additionally all the internal parts are hand fitted. All the standard springs are replaced with custom made springs from Wolff. The front sight is 1/8th inch in width with the top of the frame notched deeper and wider to accomodate the wider front sight providing a much improved sight picture while still preserving the traditional look. The trigger is tuned for a crisp break. Mine has a trigger pull of 2 pounds 6 ounces. The trigger just feels wonderful and certainly improves your groups. The grips are walnut that have been checkered by hand. The grip fit is perfect with no unsightly gaps anywhere along the grip frame. The grip frame is forged steel with a case hardened main frame also forged steel. 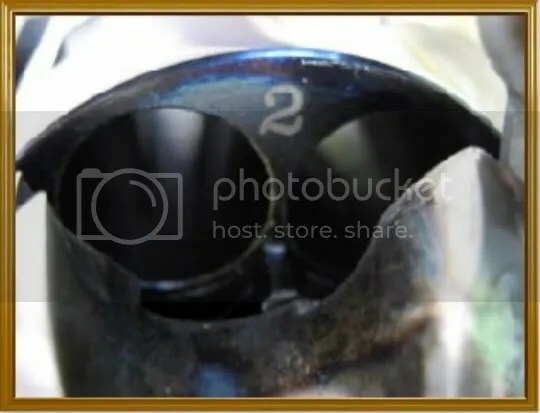 The front of the cylinder is also slightly beveled so there is no possibility of binding between the cylinder and frame. The gap between the cylinder and forcing cone is very small yet is so well fitted the cylinder rotates freely with no contact between the two even when the revolver is loaded. This is not the case with some revolvers that haven’t had the attention to detail this model has. 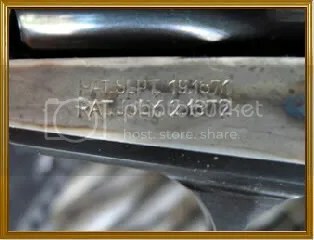 Speaking of details Uberti even includes the original patent numbers on the left side of the frame below the cylinder just like the old Colts. 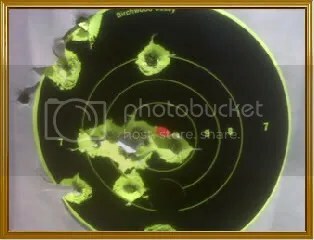 I used Winchester Cowboy loads in 250 grn lead round nose flat point. I started at ten yards loading five rounds per each cylinder. 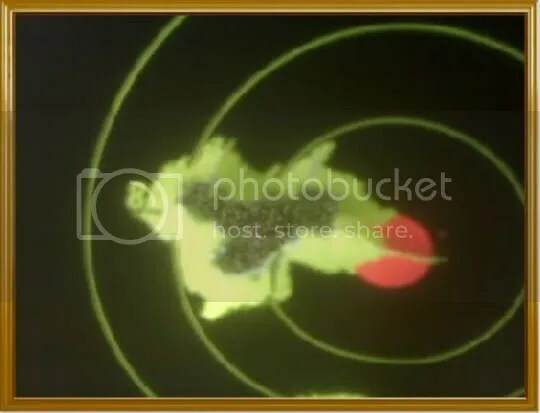 The target pictured above was my first target fired slowly to establish a good reference group. Pictured are all five rounds on a birchwood casey five inch target. One hole measuring 7/8th inches tall by 1 1/16th wide. This is the best group one could ask for from a single action. The sights were right on the money with no adjustments needed. The target above was shot from 15 yards with the next cylinder of five rounds. Again this is slow fire. Four of the five rounds went into the same hole as the ten yard rounds. I had the one called flyer slightly below the group. Oh well it happens and it was certainly my fault. Regardless this is one heck of a group for any revolver but all the more impressive from a single action revolver with fixed sights! 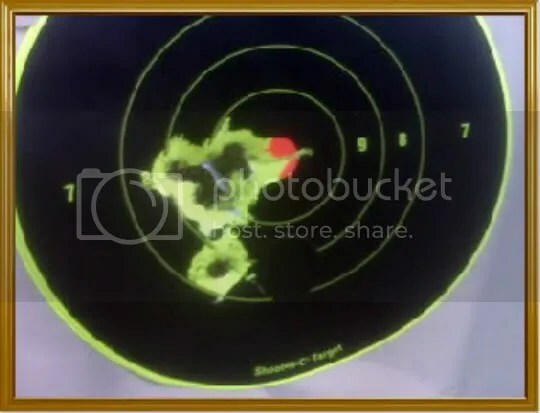 This last target is from seven yards fast draw. It’s been way to long to try fanning without more practice so after firing 100 rounds I moved to the seven yard line and fired the group pictured above by drawing, firing one round reholstering and repeating. All shots were fired by drawing, pushing the revolver forward until the top of the revolver was visible low in my peripheral vision. Fifteen rounds were fired with very satisfactory results considering I’m somehwat rusty in this technique. A word on ammunition. Back before the advent of Cowboy action competition all the ammunition companies loaded 45 Colt fairly hot for use in the S&W model 25 revolver which is an N frame revolver that can handle pretty heavy loads. When Cowboy action competition started and really took off the ammunition companies backed way off on the loads they sold for the 45 Colt chambering since the single action clones of the old Colt couldn’t handle the hotter loads without the possibility of damage or a failure of the gun. These days about the only company that makes hot loads in this caliber is Cor-Bon but don’t shoot these +P loads in a replica Colt under any circumstances. These loads are made strictly for modern revolvers only. When shooting your cowboy gun use only the loads made for this gun. They are designated as cowboy loads and are marked as such on the box. PMC as well as Winchester and others make them. The Winchester loads are mild at approx. 700 FPS whereas the PMC load is an 800 FPS load. 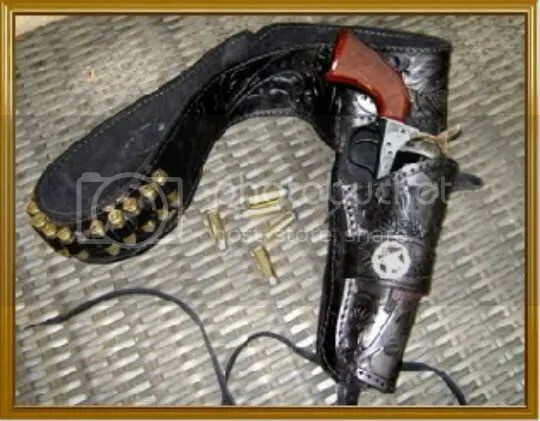 One last item should be noted as regards the safety features of this revolver. The standard practice of chambering only five rounds is still a good idea with an empty chamber under the firing pin. There is an additional safety on this model. The cylinder retaining pin normally has one notch to hold it in place securing the cylinder. The Uberti pin has two notches which allows the pin to be pushed into the second notch which blocks the hammer from striking a chambered round. I’m not really fond of this feature since it would be very easy to disable the gun without meaning to. Leaving the chamber empty under the hammer is still the best safety. The pin on the Uberti is identical with the Colt which has one notch so you can buy a Colt cylinder retaining pin and avoid the accidental blocking of the hammer. I hope you enjoyed this review and as always if you have any questions about this gun or any gun related question feel free to comment and I will get back to you via email as soon as possible.